Making the Most of New Facilities added 2014. 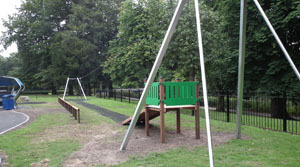 Testing the New Zip-Wire to Ensure it is Safe for our Children?? Hold Events in the Park, this is The Can't Sing Choir - Oh Yes They Can! What Facilities does Congleton Park Offer? 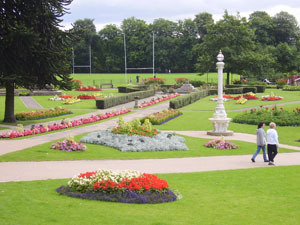 The Friends of Congleton Park are a constituted group, formed in 2005, which aims to promote the use and awareness of the Park for the enjoyment of the public, in partnership with Cheshire East Council, under the Guidance and support of the Park Manager. The Group may act as a consultative body on the Park's developments, fund raise, and organize and support events. The Friends welcome new members, and new ideas, and will encourage you to get actively involved. 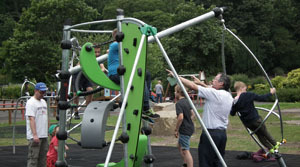 One of the new pieces of equipment, and the immensely popular new zip wire, loved by 'children' of all ages! 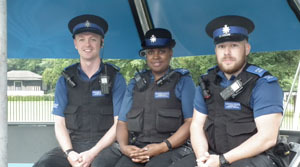 Three of our wonderful PCSO officers who help to keep the Park safe at all sorts of hours for us, and new tables have been added along with safety matting to help keep bruises to a minimum for our children. 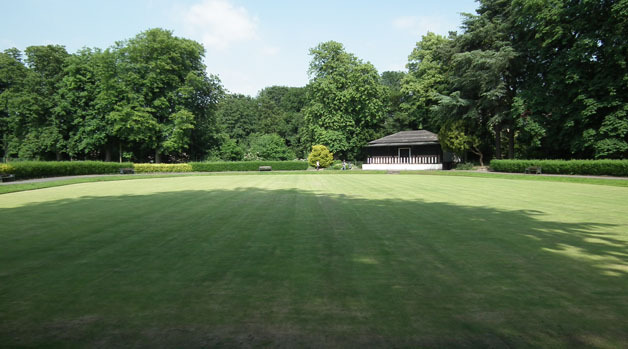 The park Bowling Green is available free for individual public use outside of booked periods. Teams can hire the green throughout the year either for one off sessions or throughout the bowling season. For more information about hiring the Bowling Green see the Fixtures List. 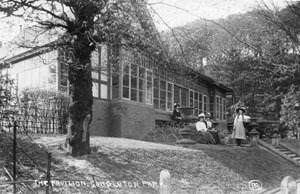 The Pavilion was designed and built in 1887 to celebrate the Golden Jubilee of Queen Victoria and acted as a social focus within the park. The Pavilion offers a light refreshment and informal dining service whilst providing some of the best views over the Jubilee Gardens. 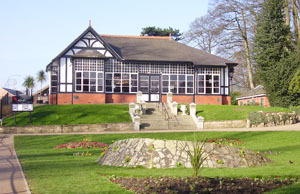 'Stock at The Pavilion' is known as being the perfect venue for birthdays, christenings and celebrations as well as its hugely popular theme nights. For opening hours Please Visit their Website. 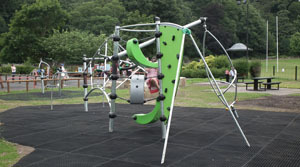 This Play Area is immensely popular with Mums, Dads and Grandparents not to mention children of all ages. 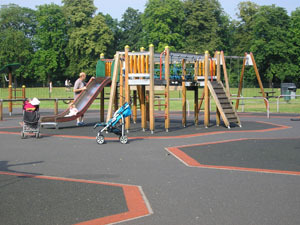 The surface is of special construction to help prevent / minimise injury if children trip, slip or fall as children do. 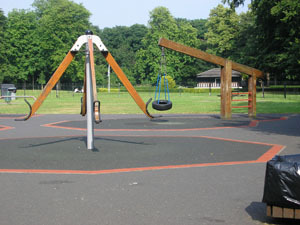 It is ring fenced with just two gates to help prevent children wandering off. It is roughly speaking the site of the old tennis courts, which some of our older residents will remember. 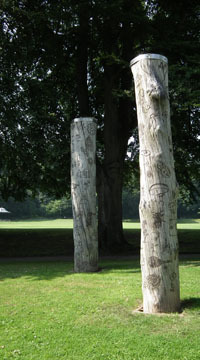 Ancient Semi-Natural woodland is described as being composed largely of trees, shrubs and ground flora that have grown through the process of natural regeneration, stump growth and coppice. 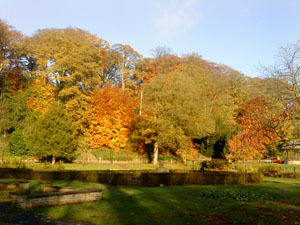 In order for a woodland to be defined as ancient there must be evidence of continual woodland since 1600 AD. 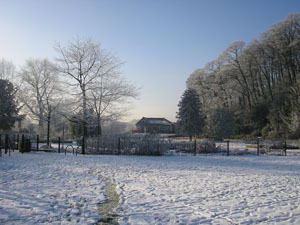 Semi-natural woodland is defined by the current tree and shrub crop within the site and these woodlands tend to be the most important for nature conservation, (English Nature 2001). 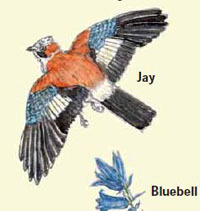 The continuity of woodland cover is shown through the underwood and ground flora rather than the tree canopy and stand as the tree stand may change species but the ground flora will remain largely the same. Situated on several natural springs the wood contains three distinct habitats, these being the wet flushes, oak / sycamore dominated canopy and the beech dominated canopy. The wood is well known for is colourful carpets of spring flowers. 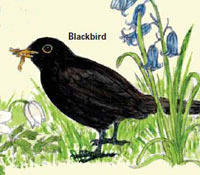 Some of the birds you may see as you walk through the wood include the Wren, Song Thrush, Blackcap, Nuthatch, Tree Creeper, Greater Spotted Woodpecker and Chiff Chaff along with other more common woodland species. All the paths through the woodland are of a formal bound gravel nature ensuring that the wood is accessible throughout the year. However some of these paths are steep and contain steps. 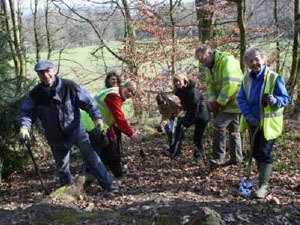 The picture above shows some of our wonderful volunteers constructing these paths. 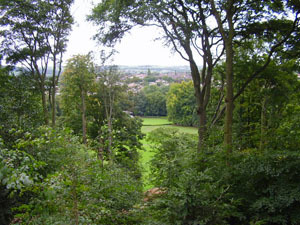 The other image shows the view from the Viewing Point, the site of the former Russian cannon. Dead centre of the picture, you can see the Bowling Green. 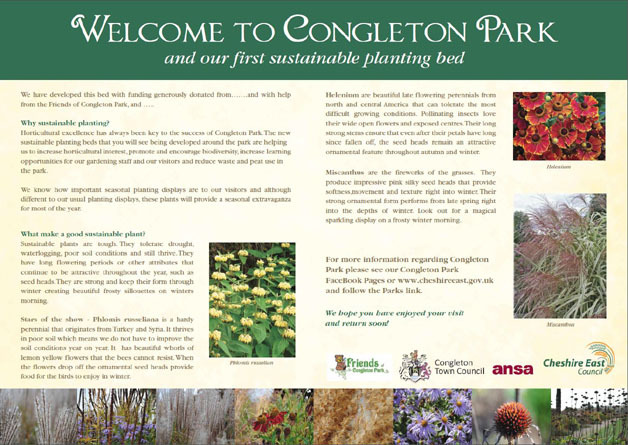 The Friends of Congleton Park, in conjunction with Congleton Town Council, ansa and Cheshire East have undertaken a sustainable planting programme in the park. For more information, you can download our PDF Here.